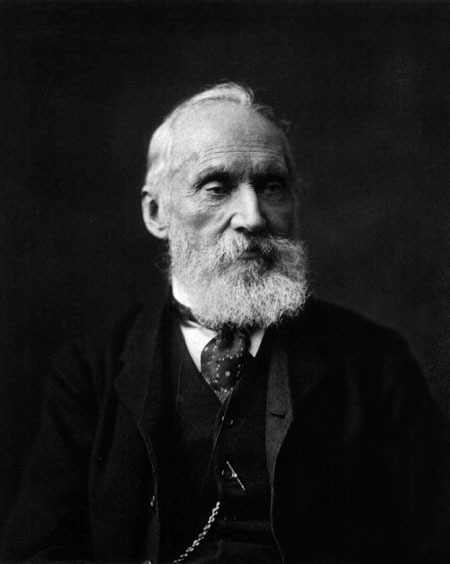 Kelvin was born William Thomson on June 26, 1824, in Belfast, Ireland. (He adopted the name Kelvin when he became a baron in 1892.) From his father, a university mathematics professor, he learned recent, advanced mathematics that was not yet taught at British schools. He entered the University of Glasgow at age 10, where he was introduced to Joseph Fourier’s application of abstract mathematics to investigate heat flow, which was controversial at the time. After transferring to Cambridge University in 1841, Thomson published two papers defending Fourier’s approach and became the first to suggest that the approach be used in other fields, including the study of fluids and electricity. Graduating from Cambridge in 1845, he was elected the following year to become head of the natural philosophy (later physics) department at the University of Glasgow. He held the position for 53 years. Kelvin’s scientific approach was shaped by his belief that physical theories of matter and energy were converging toward one unified theory, an idea based on evidence hinting that all forms of energy are related. Studying others’ experimental results, he extracted generalizations about various physical phenomena and developed theories on hydrodynamics, elasticity, and the electrodynamic properties of metals. Applying mathematics formulated by Irish physicist George Stokes to models of rotating elastic solids, he was able to discuss some of the forces acting between electrical current and magnetism. In 1848 Kelvin introduced the scale of temperature that starts at absolute zero, the theoretically lowest possible temperature. The scale’s unit, the kelvin (K), corresponds in caloric value to one degree Celsius (C); no negative numbers exist on the Kelvin scale, and the temperature of melting ice at atmospheric pressure is 273.15°K, which corresponds to 0°C. Kelvin was intrigued by JAMES PRESCOTT JOULE’s proposition stating that heat is a form of mechanical motion, which opposed accepted doctrine that heat is a special substance that has no fixed relationship to the amount of mechanical work generated by it. In 1851 Kelvin offered mathematical support for Joule’s theory with the influential paper “On the Dynamical Theory of Heat.” The following year Kelvin and Joule collaborated and developed ideas on work and heat, including that when a gas expands without doing work (not moving a piston or a turbine, for example), the gas cools slightly. Their ideas opened the area of low­ temperature physics (cryogenics). Kelvin was also an inventor who used his successful patents to finance his research. In 1854 Kelvin became involved in Cyrus Field plan to lay submarine telegraph cable across the Atlantic Ocean. He formulated equations describing heat flow in a solid that gave the velocity of electrical current flowing through cable wire. His inventions, the mirror galvanometer and siphon recorder, served as the telegraph­ receiving mechanism in most undersea telegraph cables. Queen Victoria granted him knighthood, primarily based on the success of the transatlantic cable, which stretched between Ireland and Newfoundland, Canada, the first cable to connect both sides of the Atlantic. In his later years Kelvin owned a yacht, and his sea­going adventures resulted in several navigational patents: an improved compass, which compensated for the effects of iron and steel components of ships, a tide­ measuring device, and fathometers and sounding equipment, which measured water depth. He died at his estate near Largs, Scotland, on December 17, 1907. Kelvin’s achievements represented significant progress in nineteenth­century physics, resulting in the turn ­of­ the­ century concept that all physical change is related to energy. Kelvin’s contributions helped lay the groundwork for the First and Second Laws of Thermodynamics, which are fundamental to the modern understanding of nature. The First Law of Thermodynamics states that energy cannot be created or destroyed; its quantity is constant. The Second Law can be expressed in a number of ways. it states that a system’s entropy; a measure of its disorder, can never decrease; in other words, all systems tend toward a more disordered state. The law similarly posits that heat will flow spontaneously from a hotter system to a colder system, but will not flow in the opposite direction. Kelvin’s work on the relationship between electricity and magnetism led directly to JAMES MAXWELL’S 1865 theory that light is a form of electromagnetic radiation. This theory unified the understanding of light, electricity, and magnetism. The laying of transatlantic telegraph cables, to which Kelvin’s electrical engineering skills contributed, resulted in an international submarine communication network by the end of the nineteenth century. Kelvin’s nautical inventions had a direct impact on maritime safety. His improved compass, tidal gauges and predictors, fathometers, and sounders helped make navigation more accurate, thus saving lives by reducing shipwrecks.